To erase the data you have previously deleted, you need to shred disk free space. If you have a lot of disk free space or a slow hard drive, shredding free space can take a while. Once you have shredded the data you have previously deleted, all your confidential trash has been securely disposed of. After that, to ensure that all future confidential documents are secure deleted, drag them to ShredIt shredder, not to the Trash icon. (See: How to shred a file) If you accidentally put a confidential document into the trash, and empty the trash, then you need to shred the free space again to securely delete it. There are three ways to erase free space using ShredIt X. Using the Buttons. Double-click the ShredIt X Icon to start the app. 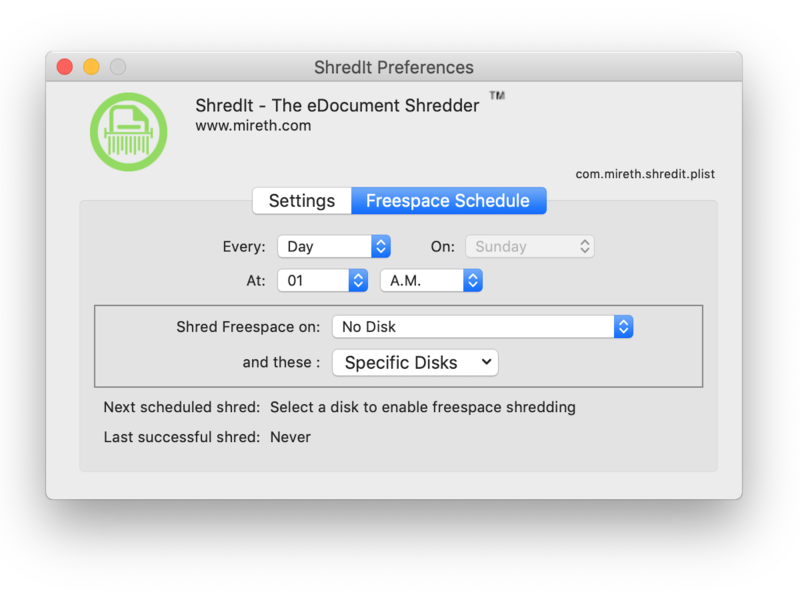 Click the “Shred Freespace” button on the main dialog. From the “Open” Dialog, pick the drive you want to erase the free space for. Using the Menu. Double-click the ShredIt X Icon to start the app, and then pick the drive you want to shred using the “File” Menu . Disk free space is the area on your hard drive containing de-allocated memory. This is where all the data you have previously deleted is stored, until it is overwritten by something else. If you have a lot of disk free space or a slow hard drive, shredding free space can take a while. To erase the data you have previously deleted, you need to shred disk free space. The easiest way to ensure that you have erased all confidential data that you have disposed of is to shred your disk free space on a regular basis. You can configure ShredIt X to do this automatically, on whatever schedule you prefer. Shredding disk free space, especially on a large drive, may take quite a long time. Your computer must be running and not asleep in order for Scheduled Free Space Shredding to run, so make sure not to schedule free space shredding at a time when the computer is sleeping or has been shutdown.